I've got a binary classification problem, which I am trying to solve using a generative classifier. If I use Gaussian Discriminant Analysis, and fit two Gaussian distributions to my two classes, the decision surface between them will be a quadratic function (derivable analytically). I am using a standard Squared Exponential Kernel, but am interested in the decision surface shape arising from other kernels as well, if they are easier to derive. As you can see in the example I crafted below, the probability surface in the case of the squared exponential (Gaussian) Kernel as covariance function for Gaussian processes looks like a smooth density. So, I'll be using R, specifically the kernlab package for this example. There's a nice gausspr function that accepts different kernel types as parameters. I'll be using the iris dataset as a binary classification problem with only two dimensions. 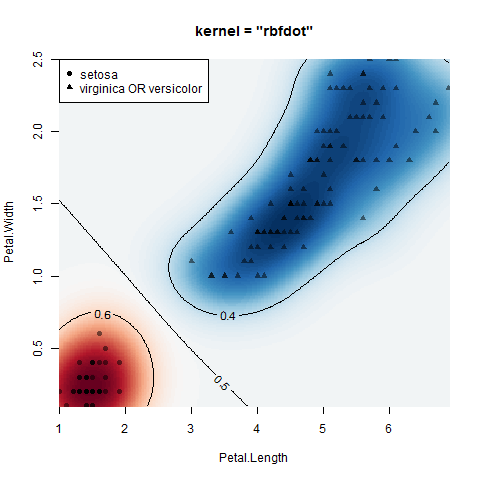 data$Species[data$Species == "virginica"] = "versicolor"
ylab = "Petal.Width", xlab = "Petal.Length", main = "kernel = \"rbfdot\""
These plots were produced with the above code. Not the answer you're looking for? Browse other questions tagged machine-learning classification gaussian-process or ask your own question. Do all machine learning algorithms separate data linearly? Gaussian Processes Probabilistic Least Squares Classifier - Leave one Out Cross-Validation Means, Variances Shape? What is the entropy of a Gaussian Process?